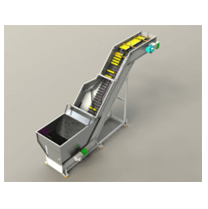 Model 2300 Elevating Hopper Feeder — Feedall designs and manufactures a complete line of hopper feeders which offer automatic handling of sliding, rolling or headed parts. The automatic hopper feeders are used with all types of grinders, presses, machining equipment and special machines. The automatic feeding process is proven to be more cost effective by eliminating expensive hand labor of feeding and saving time lost by handling parts manually. Feeds center tubes from a random loaded hopper The tubes are elevated by a cleated belt with axis-horizontal and discharged in a continuous, vertical, diameter-todiameter stack.